Your baby came equipped with several newborn reflexes to help her get by in life. Gradually, those reflexes are replaced with new skills as she grows and develops. Here's what's happening in the first couple of months of your baby's life when it comes to vision development. If your baby is light skinned, her eyes are probably still blue and will be in a state of flux until around 6 months to 1 year of age. If your baby has darker skin, her eyes are probably brown and will remain so, though they may darken or lighten in the first year. Her vision isn't as good as her hearing (which is nearly perfect at birth), but it's about 20/200. She can see very clearly about 8-10 inches from her face, which is just right for seeing your face while she's having a meal. At the end of the newborn period, she will start tracking objects and be able to see a few feet in front of her. Initially, her eyes can focus on stationary objects close to her face. Later, she will focus on objects close to her face as they are moved from one side to the other. She can study your face (or other faces) at 7 weeks and will likely prefer this view to looking at other objects. She can respond to changes in light. At the end of this period, she can focus intensely on a small object near her (like a bit of paper or lint on the carpet or a button on your sweater). At the end of this period, she may begin studying her hands or feet. At the end of this period, seeing an object beyond her reach can prompt her to reach for it. Offer brightly colored or black and white toys with good contrast and interesting patterns. Place a shatterproof mirror close by so that she can look at her own face. Allow plenty of face-to-face time with adults and siblings and look into your baby's eyes often. Change your facial expression (happy, surprise) or make silly faces. Experiment with different lighting. Open the blinds and let the natural light come in or offer times with dim lighting, perhaps nursing by candlelight. Offer a colorful mobile over her crib or bassinet. During tummy time, offer a play mat or gym. Dress her in colorful socks with interesting patterns. Read colorful books and remember to hold them close to her face so she can see the images clearly. Alternate sides when you are feeding your baby, even if you are bottle feeding. Offer eye protection when going outside. Keep baby shielded from the sun or use a visor or baby sunglasses (like ParkerG or Frubi) that block the sun's rays. All babies develop in their own special way and without regard to the fancy timetables that adults like to set for them. Even if your baby seems behind any of the above milestones, keep in mind, it's probably all normal. If at the end of the newborn period, however, you find that your baby doesn't respond to bright lights, isn't focusing on your face or other objects or one or both eyes seem cloudy, contact your health care provider for testing. Listen to your gut, too. While some vision issues are normal (for instance, it's okay if your baby's eyes cross now and again until they are 6 months old) others are not and it's always worth mentioning or seeking a second opinion. I noticed that one of my son's eyes looked different than the other just moments after he was born but nurses and doctors who looked at his eyes said there was no problem. On my own, when he was just 4 days old, I took him to a pediatric ophthalmologist and he was diagnosed with a congenital unilateral cataract as well as other vision issues. 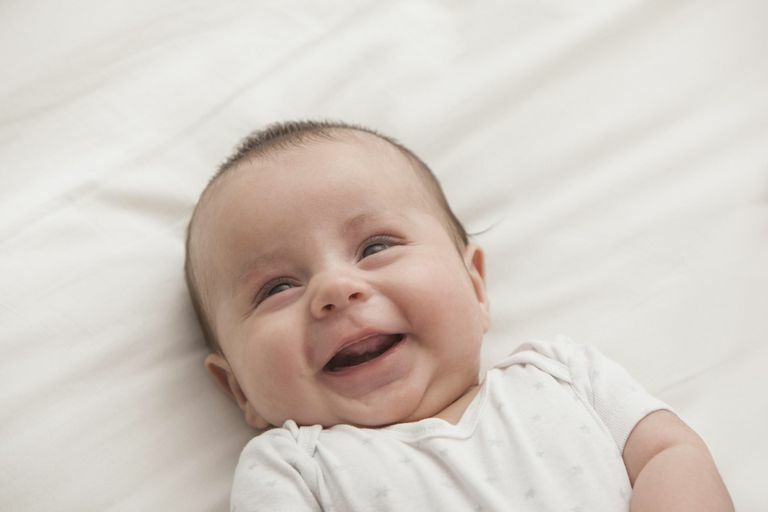 According to InfantSEE, a public health program for infants, "Pediatricians provide an important base-level eye screening that is designed to detect gross eye abnormalities. A comprehensive eye assessment by an optometrist is designed to detect much more and is an important part of your well baby care." They recommend setting your baby's first appointment with a professional eye doctor at 6 months of age. You can use their doctor locator search tool to find a participating doctor and get a free exam for your baby (no matter what your income is).